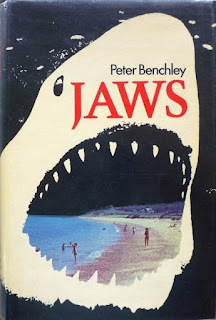 Because I Told You So: Book Report: "Jaws"
It was a shocking discovery that as great as the movie was, it basically amounted to Steven Spielberg screwing up and cheapening one of the greatest novels of the 20th century. Peter Benchley's book is disgustingly good, with vibrant storytelling that unfolds with the urgency of a police procedural, coupled with some powerful character development, mesmerizing dialogue and overwhelming pathos for its conflicting chess pieces in an unfolding disaster that no one wants to acknowledge. The interplay between Brody, Quint and Hooper -- which is definitely the high point of the movie -- is about a thousand times better in the book, due to the stakes being much higher and the conflict far deeper among them. Hooper is a far more complex and nefarious character in the book than the movie, and Brody's heroism is more defnied and his self-sacrifice more profound. The movie version of the shark is more powerful and meaner than the book version, but the latter is more frightening due to the realism with which he's treated. About the only improvement the film makes on the source material is the "we're gonna need a bigger boat" line.